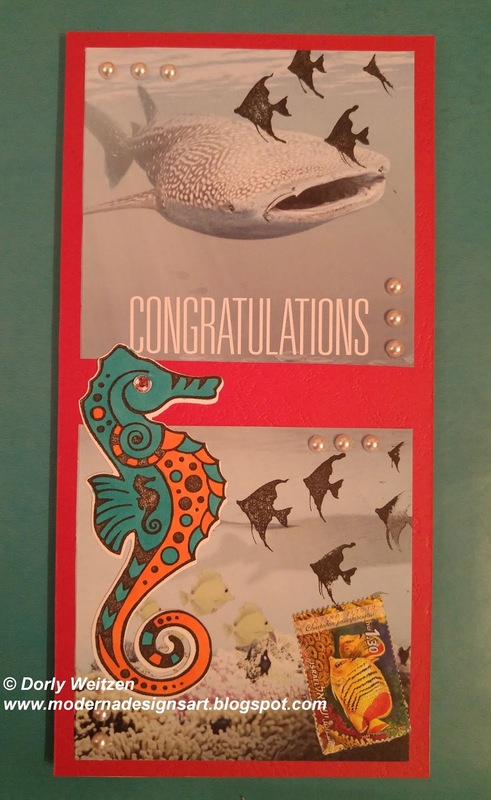 My 3rd card for this week is a Seahorse and Fish Congratulations Card. The red background paper is a leather textured CS. I cut the 2 paper squares from my son's Scuba Diving license brochure, it had such a unique nautical themed pattern, I just had to re-use it. I used Michael Strong's Cloisonné Seahorse stamp (large). I cut the Seahorse using Michael Strong Sea Horses Metal Die Cutter, it cuts like butter. I colored the Seahorse using ProMarkers, and added a bling for its eye. 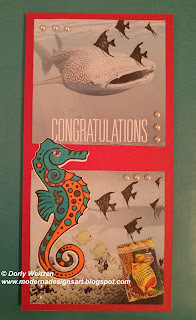 I also used the School of Fish stamp from Designs by Ryn. I added stamps, a used postal stamp with a colorful fish (it's a perfect match), and several pearls to add some glam. I like the way you combined the picture and the stamps (both paper and rubber) and made it into a beautiful under water scene! אמנם אנחנו בנובמבר ,, אבל אצלך שולט מזל דגים בעשיה הסקראפית..:-).. שילוב מעניין ומרתק של רקע ימי מצולם בשילוב החתמה יפיפיה מעל של סוסון ים מבית מייקל סטרונג,, שילוב נהדר ושיוצר מראה שונה ומיוחד,,תוספת חצאי הפנינה מוסיפים קסם ומזכירים בועות...ומעדנים את המראה..
Love how you reused your son's scuba diving brochure in this. It's an excellent base for the other elements in this card. Also like the bright colours against the muted tones in the photo.